For Day Nine of the 30 Paintings in 30 Days I chose to paint something that is a big part of who I am - "Paint, Paper, and Paintbrush". This is especially true right now during this 30 in 30 Challenge! The paintbrush is the same one I have used for 20 plus years. It is a number 38 round, Golden Fleece by Cheap Joes. I even used my #38 to paint the brush in this painting! The paper in this painting are pieces of paper that I crumpled after printing a drawing and a couple paintings of mine. The tubes of Paint in this scene are some of the colors on my palette. I use about five different brands, but Daniel Smith paint is my favorite! The colors in the painting are: Pyrrol Orange, Pthalo Blue, Aureolin Yellow, Sap Green, Permanent Rose, and Quinacridone Magenta. 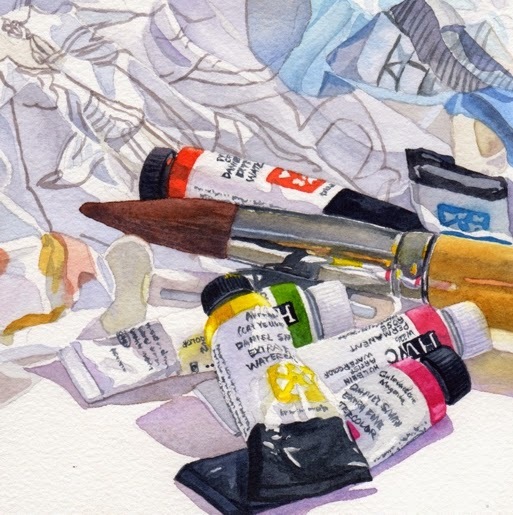 "Paint, Paper, and Paintbrush" is a 6"x6" watercolor and is Not For Sale. Une très belle aquarelle... elle a une âme.